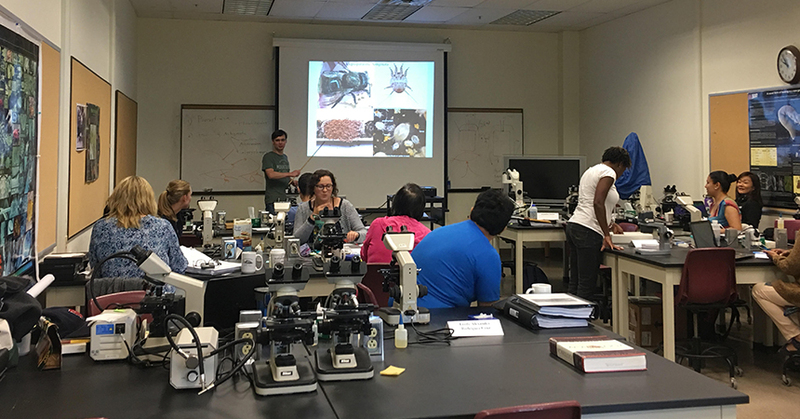 The Acarology Summer Program has been held at Ohio State University (OSU) for the last 66 years, making it the longest running program for training in identification of mites and ticks in the world. The 2017 session was held from June 19 through July 7, and it included three workshops. Introductory Acarology served either as a stand-alone course or as an introduction for the novice to prepare for the more specialized workshops. Agricultural Acarology focused on the mites associated with crops, ornamental plants, and stored products, and another workshop on the Parasitengona mites covered both the terrestrial and aquatic taxa with a primary focus on identification and classification and a secondary emphasis on life history and biogeography. Three ITP cooperators were among the eight lecturers who together taught the agricultural and Parasitengona sections. Pavel Klimov (presenting in the image above), a research scientist at the University of Michigan and the lead author of Bee Mite ID: Bee-associated Mite Genera of the World, taught a section on stored-product mites. Ron Ochoa, a mite expert with the USDA Agricultural Research Service’s Systematic Entomology Laboratory and contributor to Bee Mite ID and to Flat Mites of the World, helped teach a section on spider mites and other agriculturally significant groups. Cal Welbourn, a mite expert with the Florida Department of Agriculture and Consumer Services who contributed to ITP’s Resource for Pests and Diseases of Cultivated Palms, has been teaching at the Summer Program for many years, and he helped teach both of the 2017 specialized workshops. Due to high demand, OSU has already posted a tentative schedule for the 2018 summer program, which includes sessions on medical and veterinary acarology as well as soil acarology. Early registration is encouraged, as workshops tend to fill up early. Klimov, Ochoa, and Welbourn will be among the lecturers for these workshops as well. The 2018 workshops will be the last held at OSU, though the program may continue in whole or in part at another location in the future.